For the next two weeks, work brings me to Asia. I’ve been thinking about what to post whilst I am away, as funnily enough gardening is not one the activities on my agenda. However the beauty of plants is that they can be found everywhere, so armed with a field guide to the tropical plants of Asia and my iPhone, I am hoping I can bring you a glimpse of some of the flora out here. Unlike UK garden plants I can rarely put a name to anything I see, but it’s fun trying to work them out. I apologise now for any botanical errors. My trip will take me to India, Thailand, Vietnam and China, so it will be hot and humid throughout – conditions much better suited to plants than humans in my opinion! The view from my hotel room, in the Diplomatic Enclave area of New Delhi, looks out over a surprisingly green landscape of low apartment blocks and villas, surrounded by mature trees. 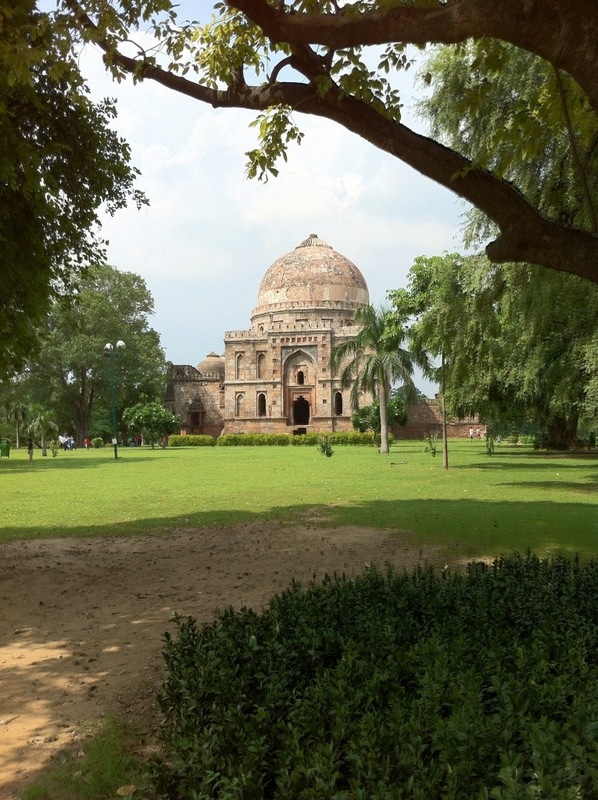 It’s the Delhi of Lutyens – planned on the grandest of scales and much more orderly than Old Delhi. There has been rain here over the last few days which has helped freshen things up. I have one afternoon off during the whole trip, and that was this afternoon. 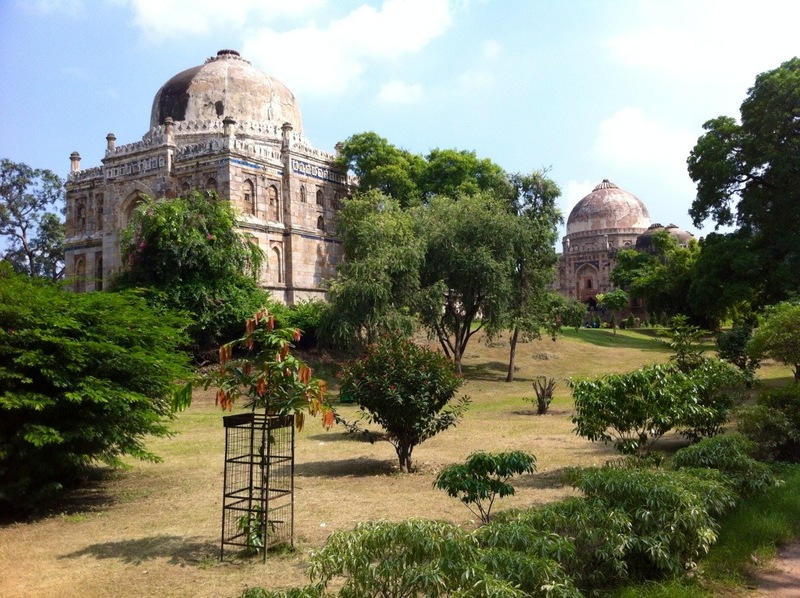 Despite only 3 hours sleep on the plane I made my first stop at the Lodi Gardens, a 90 acre park to the south of Delhi. The grounds surround numerous tombs built in the 15th century by the Sayyid and Lodis, a Pashtun dynasty which ruled much of Northern India. The site is now protected by the Archeological Survey of India, particularly as there are very few buildings left from this period elsewhere in India. 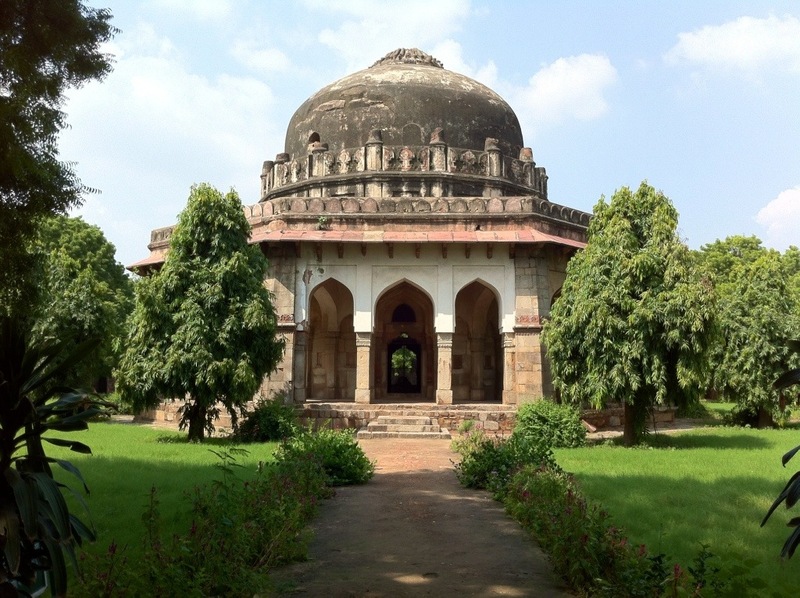 Above, the tomb of Sikander Lodi, flanked by a pair of Ashoka trees. Below, the Bada Gumbad Complex (sounds rather like a psychological condition!). In 1936 the villages which had sprung up around the tombs were relocated in order to create a garden in the English style. It was landscaped by Lady Willingdon (I assume not personally), wife of the British Governor-General of India, and later re-worked by J. A. Stein, an American architect. Lodi is not Kew by any stretch of the imagination, but is a lovely place to stroll on a hot afternoon (everyone apart from the mad Englishman was sitting quietly in the shade! ), brimming with birds, butterflies and tiny five-striped palm squirrels which don’t seem afraid of anything at all. 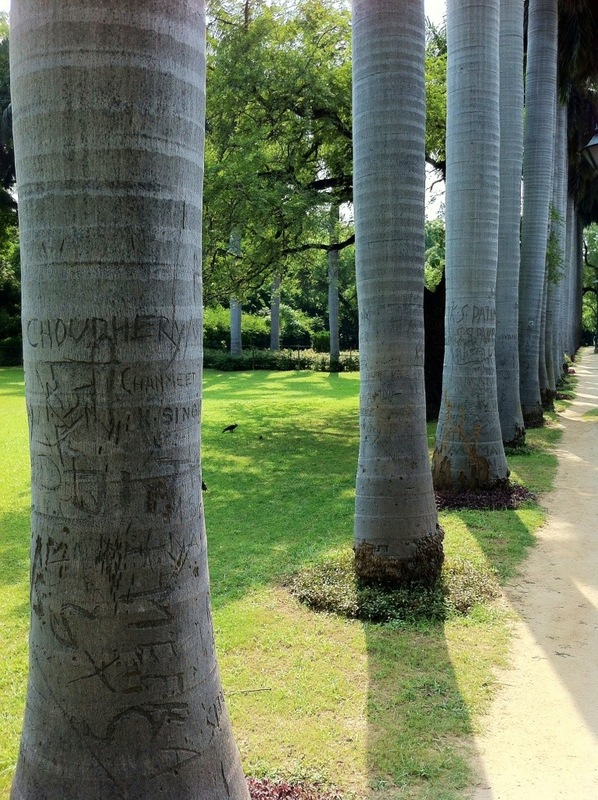 A few trees were marked with their latin names, which helped get me started. 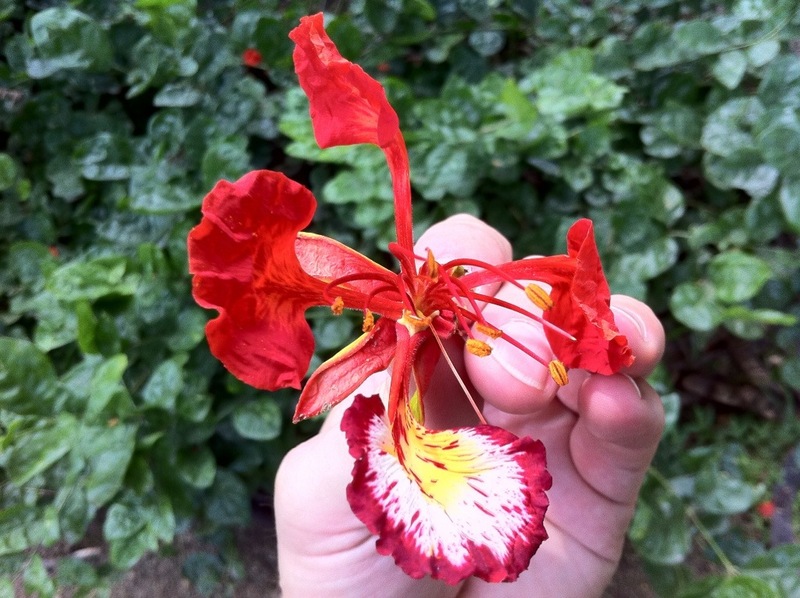 Particularly superb was a towering flame tree or flambuoyant (Delonix regia), the ground beneath its finely feathered canopy scattered with red flowers and giant seed pods. I rescued a flower to give you an idea of what was happening 18 metres up. All around Delhi these are in bloom, so it must be their season. 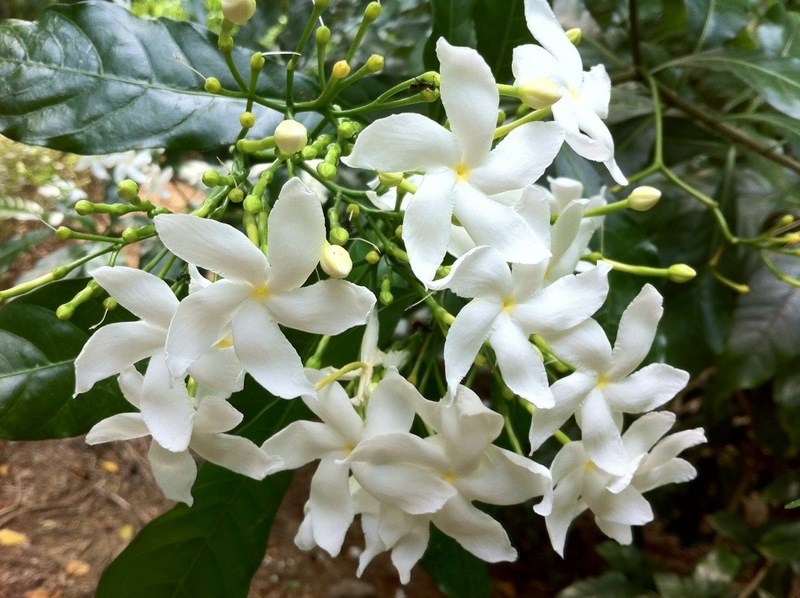 A number of plants featured heavily throughout the park, including jasmine-like Tabernaemontana cumingiana (careful how you say that! ), pictured below. This is an extremely pretty but poisonous shrub which grows up to 2m tall. 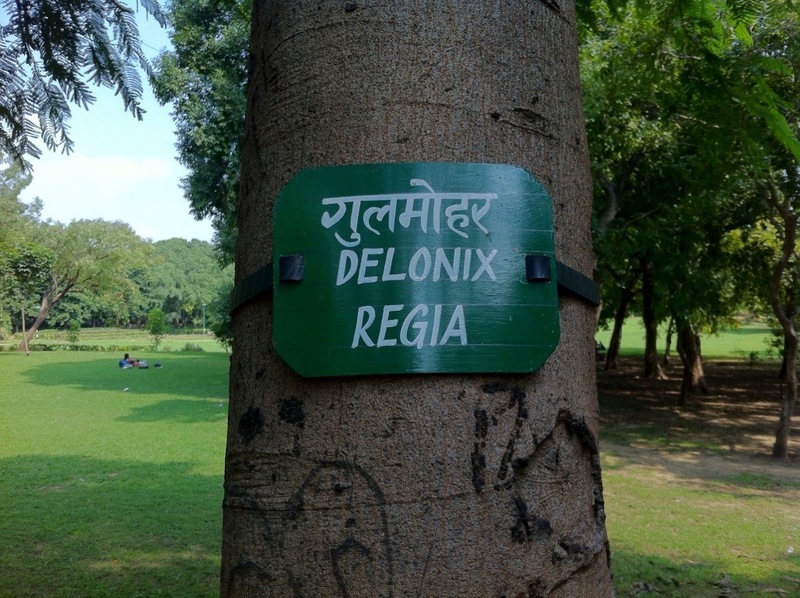 It’s never a surprise to see the Ashoka tree (Polyalthia longifolia var.pandurata) in India, the subcontinent’s answer to leylandii . This willowy-looking tree is often planted hear Hindu temples or for screening, and is apparently popular with bats and flying foxes. 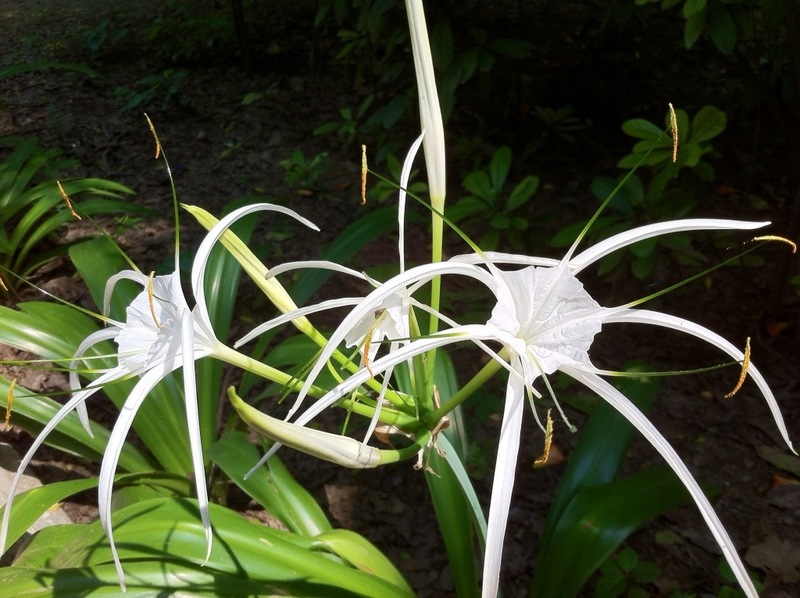 Down at ground level and lining every path was Hymenocallis littoralis, the spider lily. It must not be the season for this whiskery-flowered creature, but I found just one or two plants with some blooms. I ended my walk at the the tomb of Mohammad Shah, surrounded by avenues of royal palms (Roystonia regia), their smooth bark scarred by hundreds of visitors wanting to leave their mark. If you are in Delhi and feel the need to escape the hustle and bustle I’d really recommend a visit to the Lodi Gardens for the peace and wildlife as much as the history. And it’s free. Later on, some light shopping followed at Hauz Khas village – I can’t comprehend coming all this way without buying something to take home. 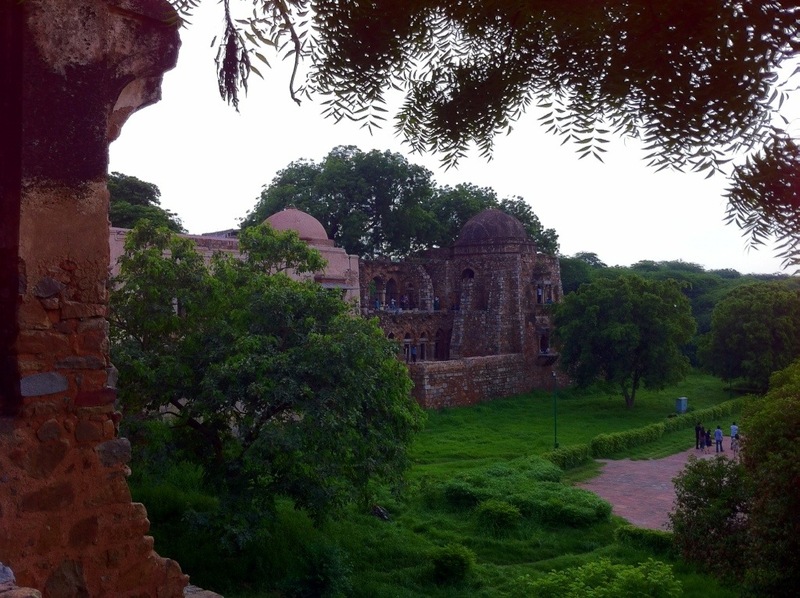 There’s more to Hauz Khas (which means royal tank, owing to it being the site of the ancient city of Siri’s main reservoir) than shops, and I enjoyed a quick clamber around the ruins of Feroz Shah’s Tomb and College of Higher Education cleverly positioned to overlook the water. Now back at my hotel I have two weeks of hard graft stretching ahead of me. But at least there’ll be plant spotting along the way to keep me amused.